The Fast ForWord Foundations II exercise Polar Planet focuses on the following tasks, goals, and skills. Task. Identify a target word when presented within a series of words. The ability to recognize words, the ability to recognize the relationship between letters and sounds, and the ability to understand letter patterns. The ability to understand that words are composed of different sounds, including the ability to identify and manipulate those sounds in a quick and efficient manner. This skill facilitates both spelling words and decoding them. The ability to visually track from left to right, as required during reading. The ability to hold a sound sequence in working memory while recalling symbol-sound associations from long-term memory. The ability to focus and sustain attention. The ability to process spoken and written words. Polar Planet presents words that differ by initial consonant or final consonant. For example, the words big and dig differ by initial consonant. 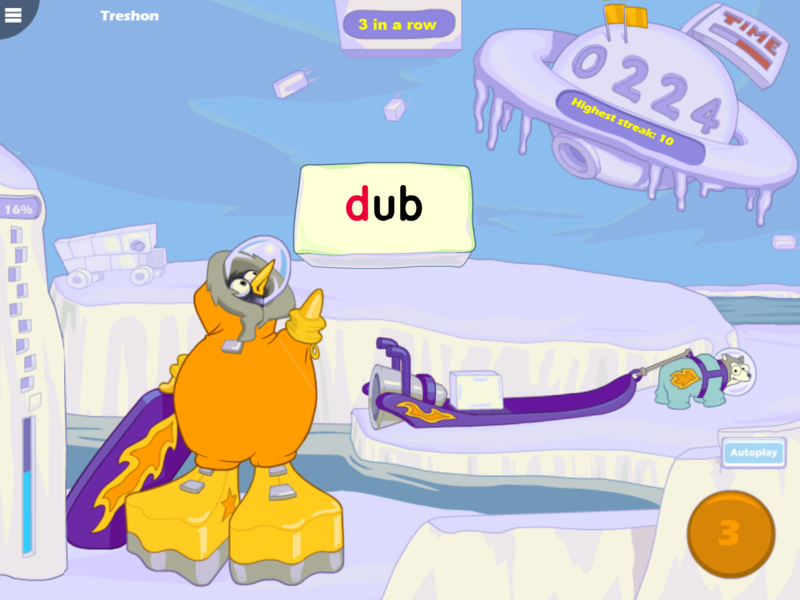 Polar Planet includes Scientific Learning’s patented speech processing technology. At first, Polar Planet presents words in which the speech sounds have been digitally altered using patented methods (including selective intensity increases) to provide enhanced learning opportunities. Initially, the consonant sounds in each word have been enhanced relative to the vowel sound. For example, the word bid is initially presented with acoustically modified versions of the /b/ and /d/ sounds. As the student progresses through the exercise, Polar Planet decreases this processing, and eventually presents the words using natural speech. Note: Foundations I includes all five patented speech processing levels, whereas Foundations II only includes the highest three processing levels (Levels 3-5). Polar Planet takes place on the surface of a frozen world. The object of the exercise is to help the polar penguin build ice machines by correctly identifying a target word when presented within a series of similar words. To work on Polar Planet, the student clicks the Go button to start. Polar Planet presents a target word, then presents a series of words associated with ice blocks. The student must click the ice block when they hear and /or read the target word. To help the student move from listening to reading, Polar Planet changes the task as the student progresses through the exercise. Level 1. Polar Planet pronounces the target word and displays it briefly on the screen. Then, it pronounces a series of words, displaying each word as it’s pronounced. This introduces the student to reading while focusing primarily on listening skills. Level 2. Polar Planet pronounces the target word, but no longer displays it on the screen. Then, it pronounces a series of words that move across the screen from left to right. This helps the student associate the spoken and written forms of the words, while still allowing the student to rely on listening skills. Level 3. Polar Planet pronounces the target word, then it silently displays a series of words. This requires the student to read the words and no longer rely on hearing them pronounced. At the highest level of the exercise (Level 3), Polar Planet introduces the student to rapid word recognition by letting the student change the speed of the exercise. This feature appears when the student demonstrates proficiency at the standard pace by answering 6 of the last 8 trials correctly, and provides agency by letting the student control how fast the stimuli move across the screen. Cool. This is the standard pace in Levels 3. Icy. This is a slightly faster pace, to challenge the student. Polar Cold. This is the fastest pace allowed in the exercise. The student must be careful and not make too many mistakes at the higher speeds, or Polar Planet will move the student back to Cool for more practice at the standard pace. To regain access to the higher speeds, the student must again demonstrate proficiency (6 of the last 8 trials correct). Help. If the student needs assistance identifying words in the highest level, the student can use the Help button. See Help. Time. The timer at the top of the screen shows the amount of time the student needs to work on the exercise that day, which is based on the student's protocol. It fills in from left to right as time elapses. When the time requirement is met, the exercise automatically closes and returns to the remaining exercises scheduled for that day. If this is the last exercise for the day, Today’s report opens. Menu. The student can use this menu to exit the exercise early, to check the network connection status, and to see exactly how much time is left to meet the day’s protocol for that exercise. To learn more see Exiting an exercise. To help speed up progress, the student can use Autoplay to take a set of multiple trials with a single click of the Go button. Autoplay becomes available early in the exercise, after the student demonstrates a basic understanding of the concepts (usually after passing a small group of trials). Once introduced, Autoplay turns on by default. The student can turn it off or back on at any time. When Autoplay is on, the student clicks the Go button one time to start a set of trials. Autoplay always starts with a set of 3 trials. The Autoplay counter shows the number of trials in the current set. If the student gets all of the trials in the set correct, the exercise adds one more trial to the next set. If the student gets any of them incorrect, the program removes one trial from the next set. An Autoplay set will never be less than 3 trials. The student can earn bonus points by responding correctly to all trials in an Autoplay set. For example, in a set of 3 trials, if each trial earns 2 points, the student would earn 6 bonus points after responding correctly to all 3 trials in the set. Note: Autoplay is not available in the Fluency Round. As the student progresses in the exercise, Paint Match presents the Fluency Round. In the Fluency Round, the student identifies target words within groups of similar words. To work on the Fluency Round, the student clicks the Go button to hear a target word pronounced. A series of words are pronounced and displayed on four ice blocks, one at a time, from left to right. The student must identify and click the ice block that presents the target word. For each target word identified, the Fluency Round awards points and the student earns that ice block. If the student answers all three trials correctly, those ice blocks are transported to the structure. The student should respond as accurately as possible to earn the most points. When the Fluency Round ends, the student returns to the main exercise. Tip: Polar Planet tracks student responses during the Fluency Round, but does not use this information to advance the student’s standing in the exercise. Instead, the Fluency Round is an opportunity for the student to review the material and earn extra points. At the highest level (Level 3), if the student needs assistance identifying the written words, the student can use the Help (?) button to see four words at the current set and stage. 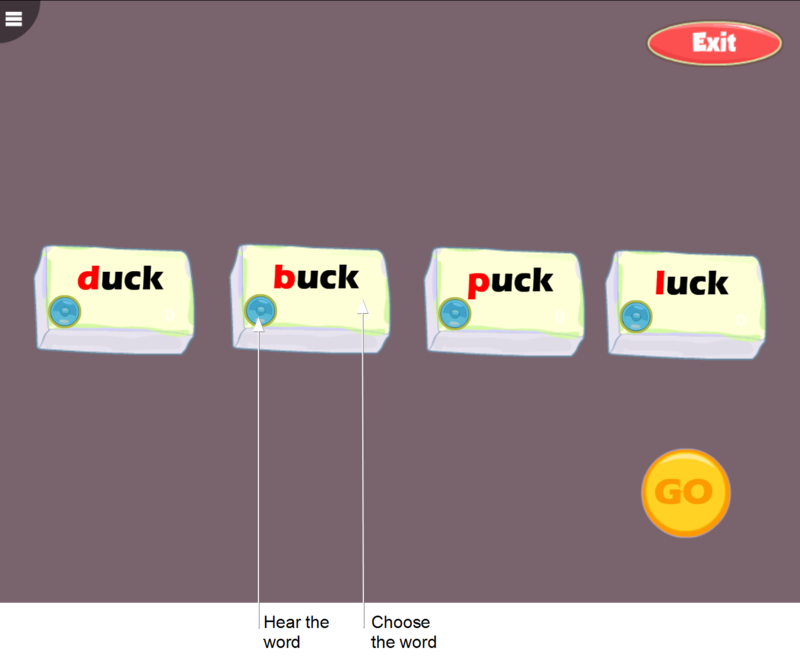 The student can click the Go button to hear a target word, and click one of four written words to select that word. The student can click a speaker to hear that word pronounced. Using Help does not affect the student’s standing in Polar Planet. Polar Planet starts with an interactive demonstration that introduces the exercise. The introduction will not be presented again. Tip: You can choose to present the introductions, instructions, and any interventions in another language, if needed. See Fast ForWord exercise intro languages. 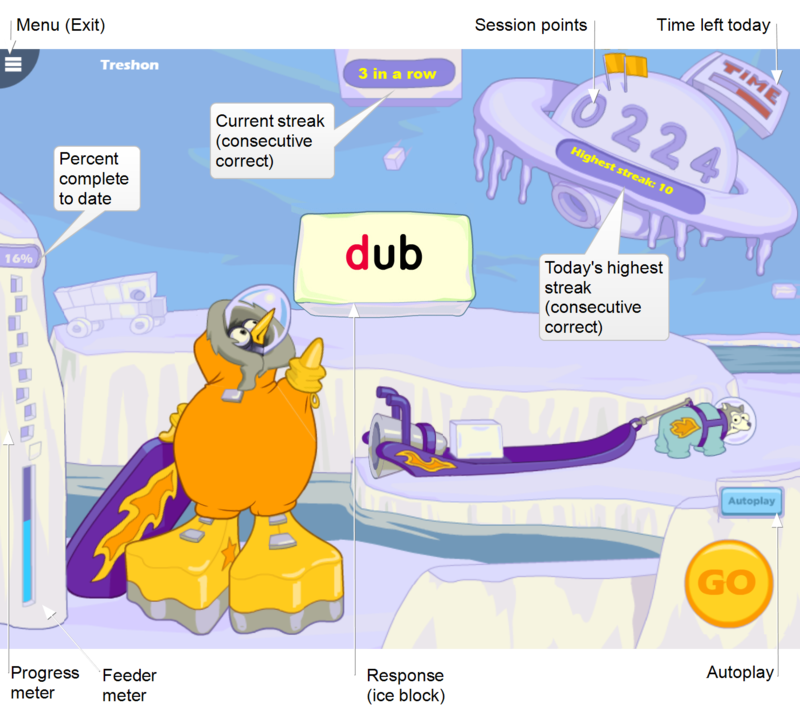 In Polar Planet, the student progresses through three speech processing levels in the exercise. Within each level, the student progresses through 54 word sets. The sets are organized around 6 target sounds (/b/, /p/, /t/, /d/, /g/, /k/) and 2 target sound positions, initial (bid vs. did) and final (bid vs. bit). Each word set includes 3 stages, depending on the student’s performance (see Advancement). After the student completes 3 sets at the highest stage, the student works on the Fluency Round. In each set, the student starts at the highest stage (Stage 3). Stages 1 and 2 are reserved for students who demonstrate difficulty discriminating particular sounds. To advance to the next stage within a set, the student must answer 3 of the last 4 trials correctly. If the student does not answer at least 2 of the first 8 trials correctly, or cannot pass the stage within 15 trials, the stage is failed. When doing well, the student may be allowed to skip Stages 1 and 2. When struggling, the student will need to work on all 3 stages. To advance to the next level, the student must pass all sets at the highest stage. When the student completes the highest level in Polar Planet, the exercise is complete. Polar Planet adapts to student performance within each set, and may transition to a new set if the student is repeatedly failing stages in a set. The set will be revisited at a later time. The exercises use built-in, responsive technology to detect when a student is struggling and administer targeted, inline instruction—right when the student needs it—without any external resources or assistance required. This “smart learning” design helps reduce frustration as it quickly gets students back on track, where they can continue making progress and achieving gains. The student can receive 1 or 2 of these interventions at a time, depending on the task and difficulty level in which the student is struggling. Each one can take anywhere from a few seconds to 2-3 minutes to complete. When appropriate, the student’s progression in the exercise stops temporarily while working through an intervention, then resumes when the student returns to the regular exercise content. To complete the exercise, the student must master all of the skills in the exercise and reach a percent complete score of 100%. If the exercise is revisited, the student will continue to repeat the content at the highest levels. To learn more see About completing a program. 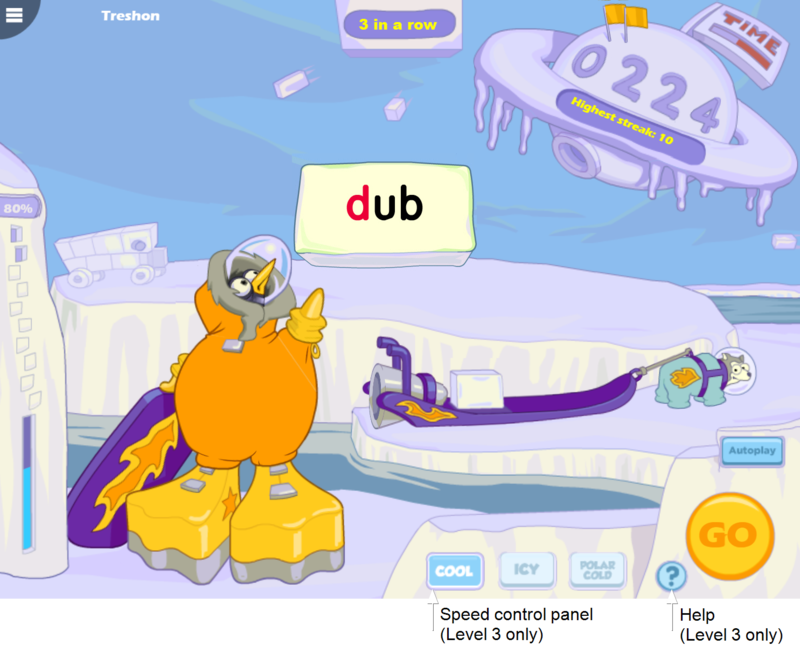 During Autoplay, students earn double the usual amount of points when they complete a set of trials without any errors. For example, in a set of 3 trials, if each trial earns 2 points, the student would earn 6 bonus points. Feeder meter. The feeder meter tracks and celebrates every 1% of content completion. At 10% complete, the meter is full, and it “feeds” that percentage into the progress meter and resets. For more on percent complete scores see the student’s Percent Complete History report. Progress meter. The progress meter tracks and celebrates every 10% of content completion. Each marker represents 10% of the exercise. When all 10 markers light up, the exercise is complete. For more on percent complete scores see the student’s Percent Complete History report. Completion status. The completion status sign shows the actual percent complete score for the exercise. The score updates each time the student completes 1%. For more on percent complete scores see the student’s Percent Complete History report. Current streak (3 in a row). At the start of each new session, the exercise tracks and shows the current “winning streak” of consecutive correct trials. After 3 consecutive correct trials in a session, a “3 in a row” sign slides onto the screen. The score increments until the streak is broken (on the first incorrect trial), at which point the sign disappears from view. The current streak sign resets to zero at the end of each streak, and at the start of the next session. Highest streak. At the start of each new day, the exercise tracks and shows the student’s best “winning streak” of consecutive correct trials. The score appears after the first 3 consecutive correct trials, and remains on the screen throughout the day. Any time the student surpasses his or her highest streak that day, the sign updates to show the latest number. The highest streak score resets to zero at the start of the next day. Speed control panel. At the highest level of the exercise, Polar Planet provides a control panel that lets the student control the speed of the exercise. More rewards. In addition to the current streak sign, the exercise uses other fun animations to encourage progress. The ice blocks in the sled indicate the number of consecutive correct responses. 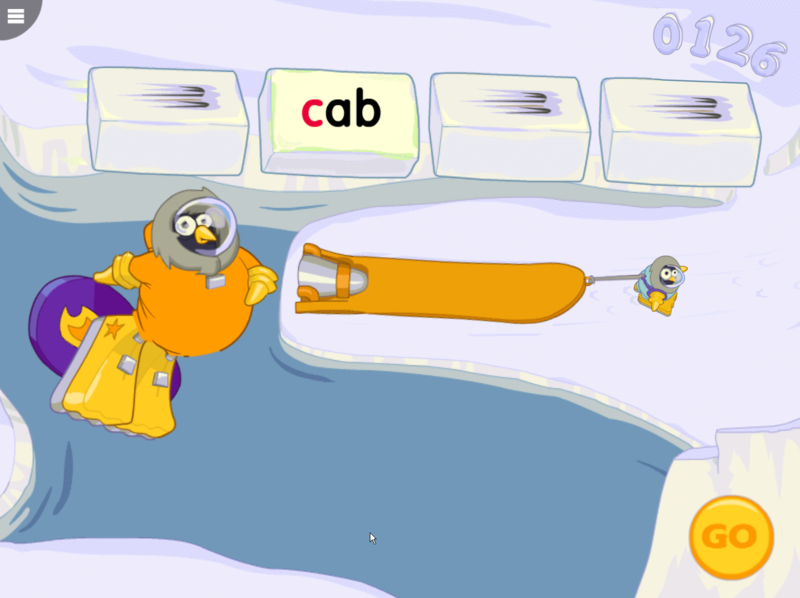 After each consecutive correct response, the penguin hits the ice block into the sled. When the student answers three consecutive trials correctly, the sled transports the three ice blocks to the glacier. The blocks are used to build fun ice structures. Each work session includes a performance goal to help motivate the student. 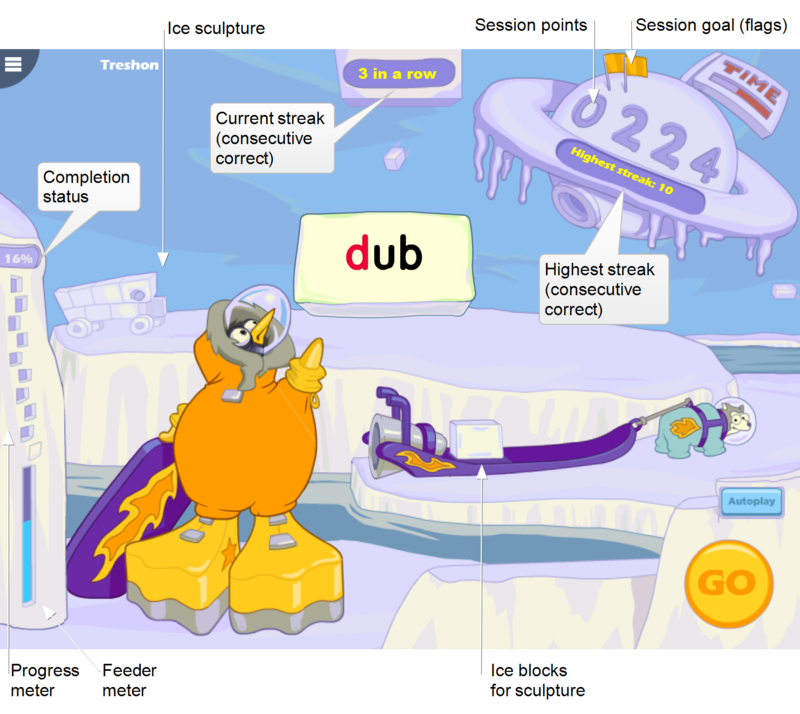 In Polar Planet, the student’s goal is to complete a structure. When the student meets the goal, a flag appears on the ice planet. Once earned, these rewards cannot be lost; the flags will remain visible until the entire product is finished.